There is a general understanding in the world of data and coding that the R community is impressively welcoming and inclusive of women. Python does not necessarily have a reputation for being exclusive, but we do not often hear accolades of its inclusivity either. In this article, I compare numbers of users in the R and Python communities. I also compare statistics on the respective women’s meetup organizations for each language: R-Ladies and PyLadies. What makes people think R is more inclusive, anyway? 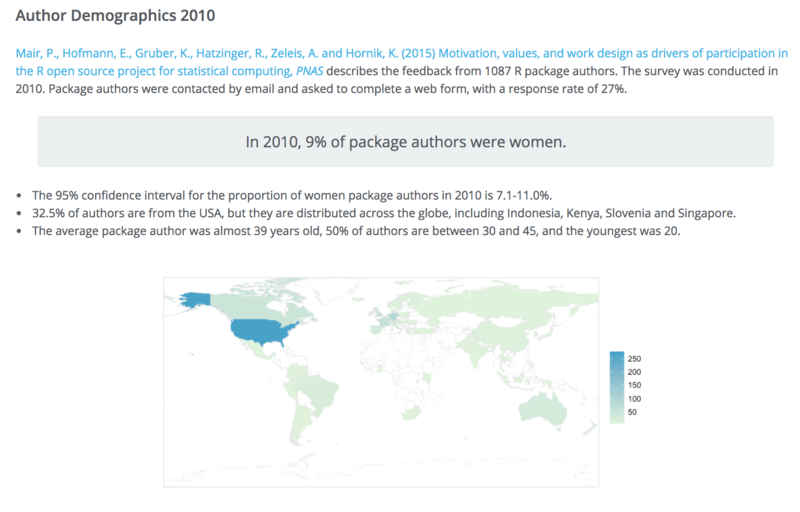 In 2010, 9% of package authors were women. Data is self-reported with a 27% response rate. While these stats are shockingly low for both groups, R has more than 4 times more female contributors than Python. This plot was presented in Inequality of Underrepresented Groups in PyData Leadership. It shows projects that are sponsored by NumFOCUS, an organization that provides fiscal support to open source projects. The projects that are higher up show a greater degree of gender inequality in open source contributions. 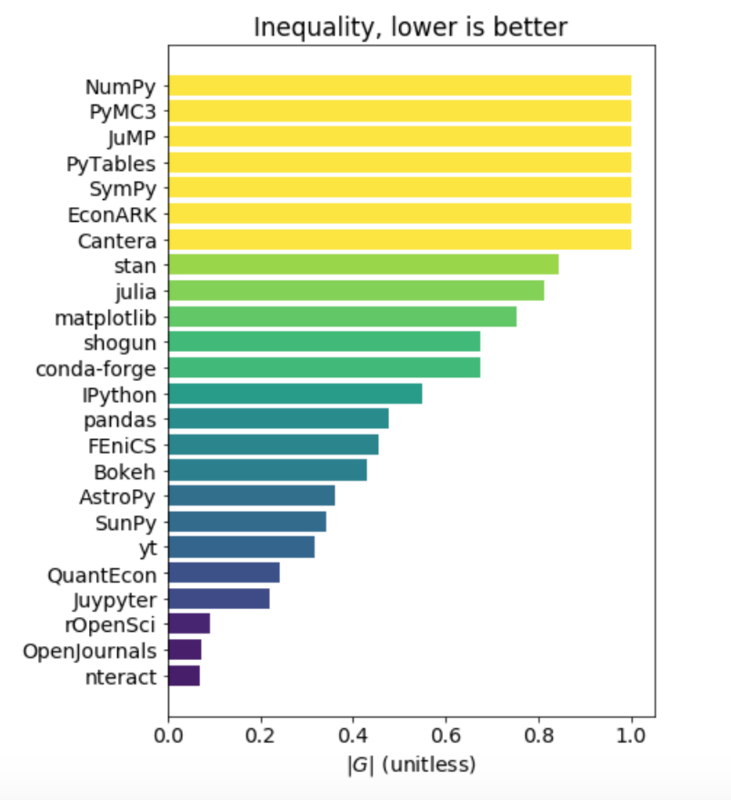 We can see many Python projects (NumPy, PyMC3, matplotlib) are higher up and rOpenSci is one with a low degree of inequality. The New York R 2018 conference had 45% women speakers. Given that there are more than 6x the number of users of Python as compared to R (loose deduction from survey), we would expect the number of meetup members to be significantly greater. But, the meetup population for PyLadies is only 1.25x greater than R-Ladies. I would like to repeat a previous statement: Data is being collected and shared. The collecting and sharing of key demographic data indicates a commitment to understanding and improving diversity. How is the R community achieving inclusion at such a high rate? How is the R community so successful and what can the Python community learn from the R community? The global PyLadies community has no formal organization behind it; no board of directors, no appointed leadership. We found that PyLadies growth and success stems from being decentralized and non-bureaucratic. We do have a few point people that can answer and address general, or non-location specific PyLadies questions. If you are not a local PyLadies leader, you may do so via our general email. If you are a local PyLadies leader, you may email our organizers list (must be added to the mailing list first). R-Ladies Global has an active board. 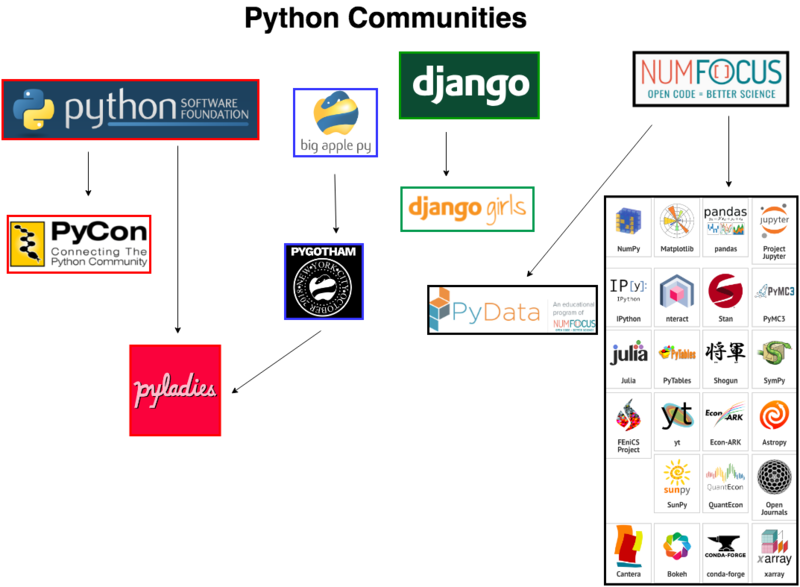 I am an organizer for both Women in Machine Learning & Data Science (WiMLDS) and PyLadies. As a board member of WiMLDS, I can say from personal experience that WiMLDS is better able to support our chapters with a board and designated leadership. It is indeed challenging, since it is a volunteer position, but well worth the effort. The PyLadies website currently has 89 chapters listed, but 17 of them are defunct, and that data has not been updated. Determining how many active chapters and members was a tedious and manual process. Comparatively, R-Ladies has a central account where it is easy to obtain the numbers. Some of the PyLadies chapters are included in the PSF account which includes various Python user groups. Here is a recently published PyLadies Overview. 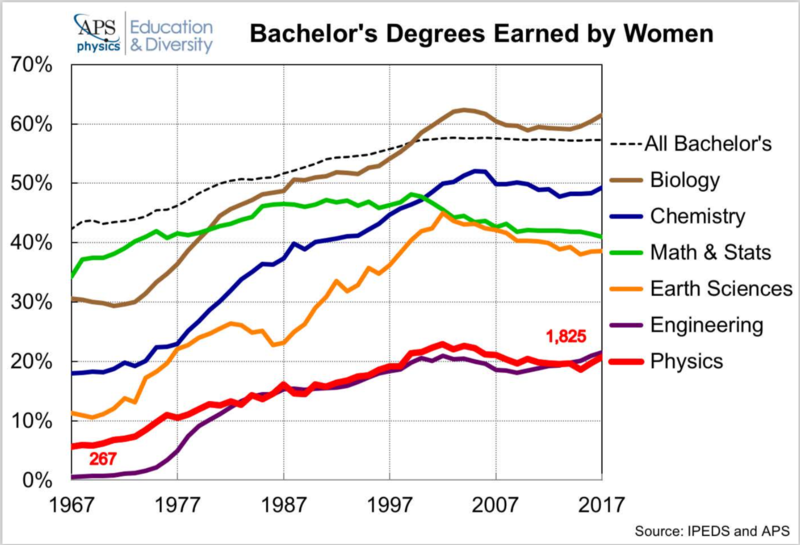 The proportion of women graduating with degrees in statistics (44%) is significantly greater than those graduating in computer science (19%). 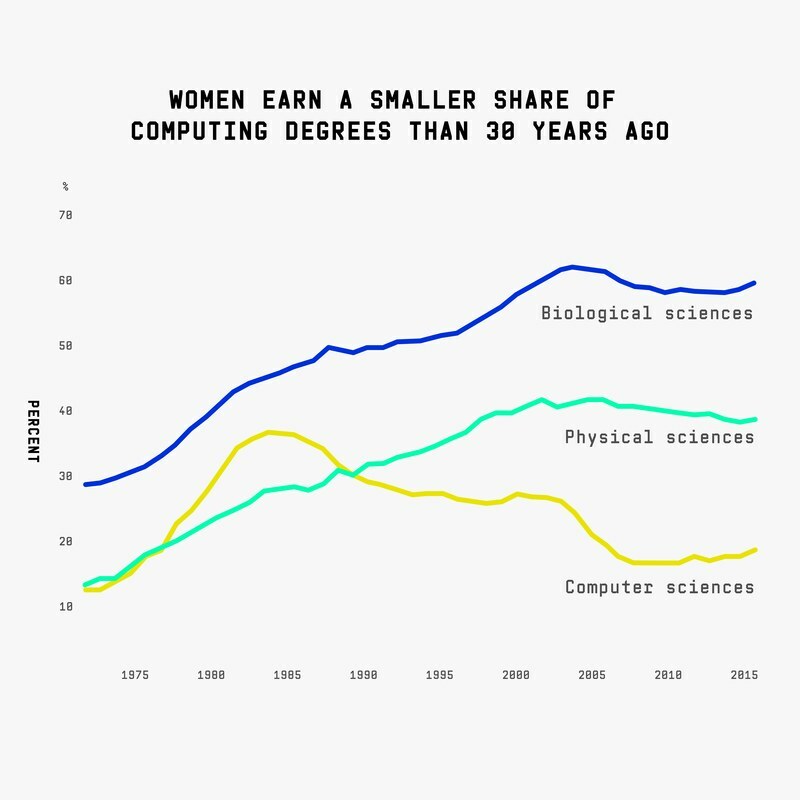 The pipeline of R users and statisticians is rich with women compared to computer science. 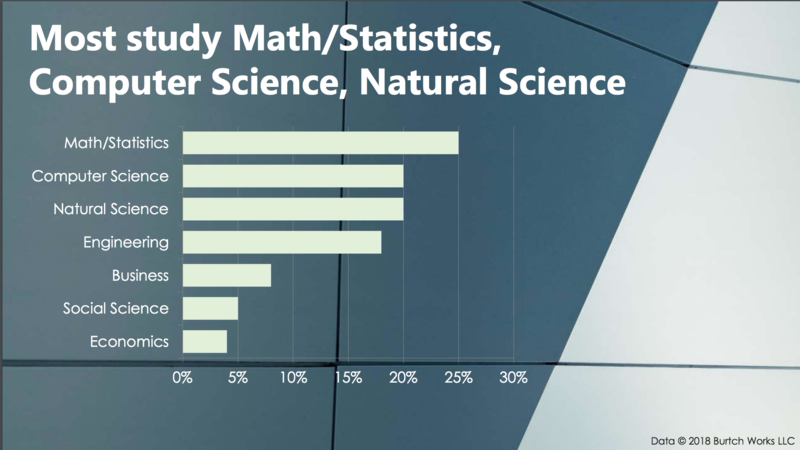 Data scientists come from a number of disciplines. For those who study math/statistics (25%), natural science (20%), social science (5%), and economics (4%), R is the primary language. For those who study computer science (20%) (and some math people), C++ or Python is more likely to be the starting coding language. In summary, there are more entry points into R from various disciplines compared to Python, and those various disciplines have a greater gender balance than in computer science. Membership in the American Statistical Association (ASA) is 53% women. ACM has nearly 100,000 members from more than 190 countries. We do not have any additional information to provide. 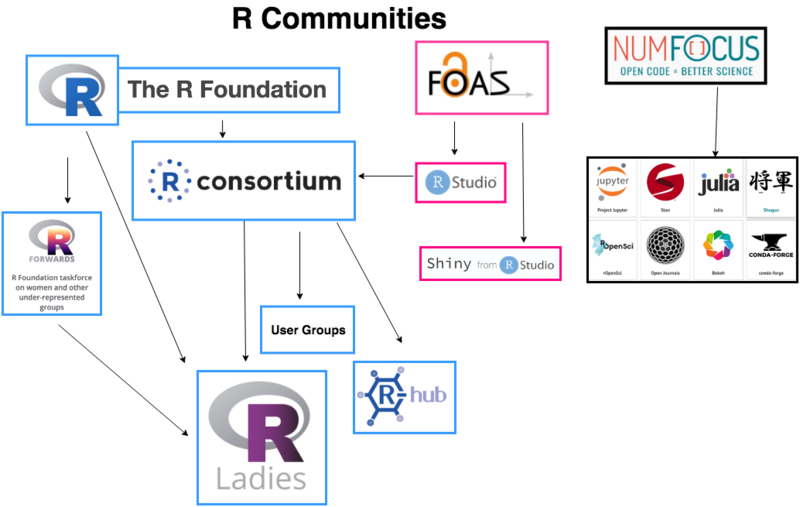 In March 2018, the R Consortium announced that R-Ladies is a top level project. This provides R-Ladies with a longer term budget cycle (3 years instead of 1 year) to support their community. R-Ladies will also have a voting seat on the Infrastructure Steering Committee of R Consortium. The broad goal of this event is to nurture regular contributors to the tidyverse by having a day where we can work together on anything ranging from submitting your first pull request, to working on a package. The R Forwards task force was set up by the R Foundation in December 2015 to address the underrepresentation of women and rebranded in January 2017 to accommodate more under-represented groups such as LGBT, minority ethnic groups, and people with disabilities in the R community. rOpenSci is an organization whose mission is to make scientific data retrieval reproducible. There is rOpenSci Educators Collaborative: What Educational Resources Work Well and Why? which provides resources to educators of the R language. Below is a network of the R communities. We can see there is a tight network of collaboration. R is used for statistical analysis and has about 10K CRAN packages. Python has the ability to be deployed at scale and the Python Package Index (PyPI) offers over 100K libraries. The fact that R is statistically based with a specific focus makes it easier to manage. As an analogy, it is much easier to know neighbors and shopkeepers in a small town than in a large city. Could we list you as someone willing to speak about your relevant R topics/experience? As a comparison, PyLadies has 45 chapters in 19 countries which is surprisingly narrow given its user base. There are a dozen women on the leadership team and “R-Masters”. The list is very long, in a good way. @WeAreRLadies, 4900+ followers, which has a weekly rotating curator for the @RLadiesGlobal community #rladies. rstudio is offering 32 domestic diversity scholarships and 6 internatioal scholarships to its 2019 conference. This table compares key details of R-Ladies and PyLadies, as well as Women in Machine Learning and Data Science (WiMLDS). WiMLDS is included because it serves both populations in data science. It is interesting to note that Python and R were released in the early 90’s (1990 and 1993) and the women’s communities were created nearly 20 years later. Python did not add a woman to their core developer team until 2017, and it seems that R does not have a woman on its core development team. This sheds some light on the need for creating, growing and supporting communities for women and all under-represented groups. What steps has the Python community taken? The Python community has acknowledged the lack of diversity in speakers, open source contributors and developers/engineers. There are various organizations with initiatives to improve diversity. Note: This article is not intended to focus only on the New York City community. I use examples of NYC events, but all the organizations have events that are world-wide. This article By Welcoming Women, Python’s Founder [Guido van Rossum] Overcomes Closed Minds In Open Source was published on November 20, 2018. …van Rossum is dedicating himself to other efforts to support the wildly successful language and community. One such activity is mentoring women apprentices to the core team of about 30 developers. Since van Rossum’s invitation to mentor women, Python has added four women to the team of around 50 core developers, with one or two apprentices who might become core developers in the next year, he says. Scikit-learn is the machine learning library of Python, and there is only 1 woman in the 100 top contributors. To increase the participation of women in open source, and specifically for scikit-learn, Andreas Mueller has organized open source sprints with NYC Women in Machine Learning and Data Science. While the event was a positive learning experience, the impact is undetermined, with 5 pull requests merged at the event, and two more merged post-sprint. It will take a while to make a significant dent. Scikit-learn has frequent sprints, a listing can be found at the end of this article. NumFOCUS DISC and Jupyter held a sprint in October 2018 to increase diversity in open source. The impact of that sprint has been published here: Highlights From The 2018 NYC DISC Sprint. Six pull requests were merged, and 72% of the attendees were first-time contributors. It is unclear how many open source sprints are being held, which are targeted to under-represented groups and their impact. This data is not being tracked by a single organization. There are many active women and URG in the Python community, but there is no central list. Here are some. On the “Python Initiatives List” is to create a list for easy reference. [a] PyLadies was founded in 2011 in Los Angeles, California by 7 women. The Python Software Foundation manages the open source licensing of Python. They also run PyCon as well as other Python conferences around the world. They have a grants program for funding special projects. PSF has 27 meetup groups in 3 countries, totaling 46K members. PyCon 2018 was held in Cleveland, Ohio this past May. It is the national conference, sponsored by PSF, and is the largest annual gathering for the community using and developing the open-source Python programming language. PyCon organizers reached out to women to encourage them to submit proposals and they also provided mentoring around the process. PyCon also offers diversity scholarships for its conference. NumFOCUS was founded in 2012, and it supports and promotes open source scientific software (some examples: Numpy, Pandas and Jupyter). Beginning in 2017, they began a Diversity in Scientific Computing (DISC) committee whose aim is to increase diversity in the open source community. Project Jupyter is taking on two interns from URG for their open source project development. PyData is an educational program of NumFOCUS which provides a forum for the international community of users and developers of data analysis tools to share ideas and learn from each other. They have a community of meetup groups with 100K members in 120 groups in 47 countries. They host meetup events as well as annual conferences in various cities. NumFOCUS / PyData offers diversity scholarships. But, there is no formal relationship between PyData and PyLadies. Sharing PyData events happens organically. In the case of PyData NYC 2018, PyLadies NYC shared their conference and diversity scholarship information because I, as an organizer for NYC PyLadies, knew the organizer for NYC PyData. In past years, conference information was not formally shared. It is unclear if there is a formal collaboration between NumFOCUS and the Python Software Foundation. Big Apple Py is an organization which supports open source in New York City. They organize the annual Python conference PyGotham. They are a transparent and inclusive NYC organization which is committed to increasing diversity of speakers and attendees at PyGotham. They offer NYC PyLadies a booth at the conference free of charge. SciPy hosts the annual Scientific Computing with Python conference. There are generally two events, one in Austin, Texas and one in Europe. From their past events, it seems that some years there is also a conference in South America. They have a Diversity Committee, and they offer diversity fellowships and assistance to first-time abstract submitters. The conference schedule also includes 2 days of open source sprints which cover over a dozen Python packages. Django is a Python-based free and open-source web framework, which follows the model-view-template architectural pattern. It is maintained by the Django Software Foundation. Django Girls is a non-profit organization and a community that empowers and helps women to organize free, one-day programming workshops by providing tools, resources and support. During each of their events, 30-60 women build their first web application using HTML, CSS, Python and Django. In 2015, the Django Girls community organized 89 events - almost 6 times as much as year before. They went to 77 cities across 36 countries and all 6 continents. In 2015, 2785 women attended their events, and more than 8,600 applied. All of those events were organized by volunteers: an army of 221 organizers and 920 coaches supported by 393 sponsors. In 2015, the Django Girls tutorial was translated to 12 languages thanks to thousands hours of work contributed by 358 translators. 169,107 people visited the Django Tutorial generating more than 2 million page views! More data is available in the 2015 Django Girls Report. How connected are the Python communities? Below is a network of some of the Python communities. It is unknown whether and to what extent the communities collaborate with each other. What more can the Python community do? The Python community is large and disparate. A good starting point would be for all the entities to connect, collaborate and measure/share diversity statistics. Create an entity designated solely for diversity for under-represented groups and connect it to all the Python communities. Create a repository of Python open source sprints and track and publish their impact. AI is the Future, But Where are the women?